CP: When did you first come to the Folk School? When were you a host? JK: I grew up with relatives in Penland and would visit the school for community days, but couldn’t align my work schedule in a way that would allow me to take a class there when I was a young full-time teacher. Someone suggested I take a look at the John C. Campbell Folk School and it was absolute love at first sight. The week-long classes, offered year-round, were a dream come true. I saved my pennies and booked a clay class over my spring break in 2005. I was teaching in a Haywood County public school and this class just lined up with my vacation days. Ted Cooley was our class assistant and two young women I knew from Asheville were the Hosts. I immediately saw the potential for myself there. I took a few more classes as a student, and then, in 2009, I served six months as Host. I was the last six-month host (the school went to a four-month system after that) but I wished it was still a 2-year position, as it was in Ellie Wilson’s time. I would have signed up instantly for that! CP: It’s always very exciting to see young folks who are part of the Folk School community take their craft to the next level and start a professional craft business. 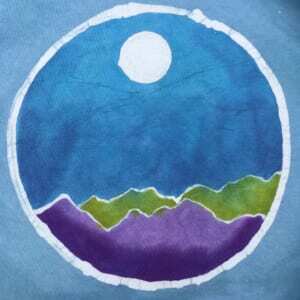 WAXON Studio is your wildly popular and acclaimed batik & dye studio based in Asheville, NC. 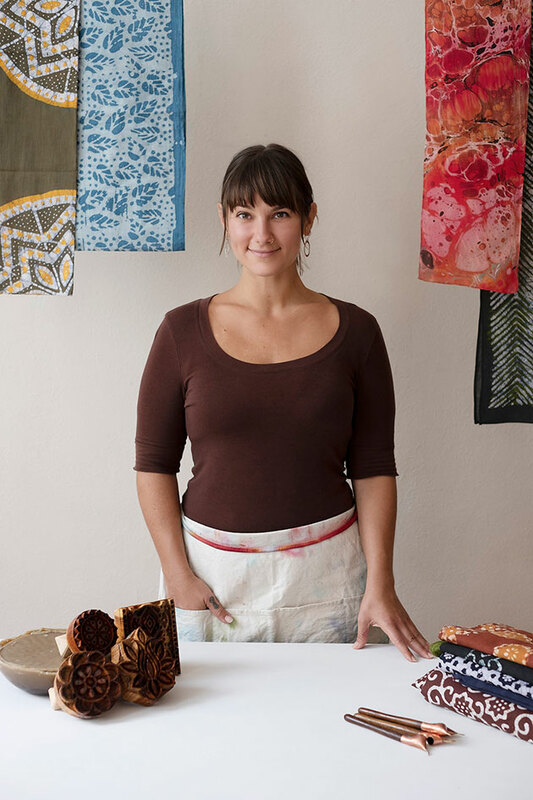 Can you talk about your transition from craft as a hobby to craft as your main livelihood? 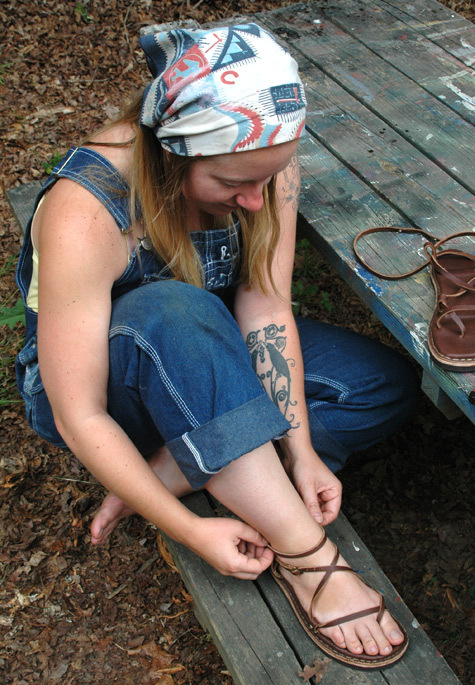 How has your craft practice changed or grown since you were a host at the Folk School? JK: I started my teaching journey as a theatre & dance teacher. After two years of doing that full time, I noticed that I was spending more energy teaching my stagehands to knit so that they would be occupied during rehearsals, and hanging out with the art teacher talking about fabrics and color, than I was drawn to my performing arts tasks. When I started blowing off choreographing dances so that I could take pottery classes and fantasizing about learning basketry, I knew the tide had turned for me. 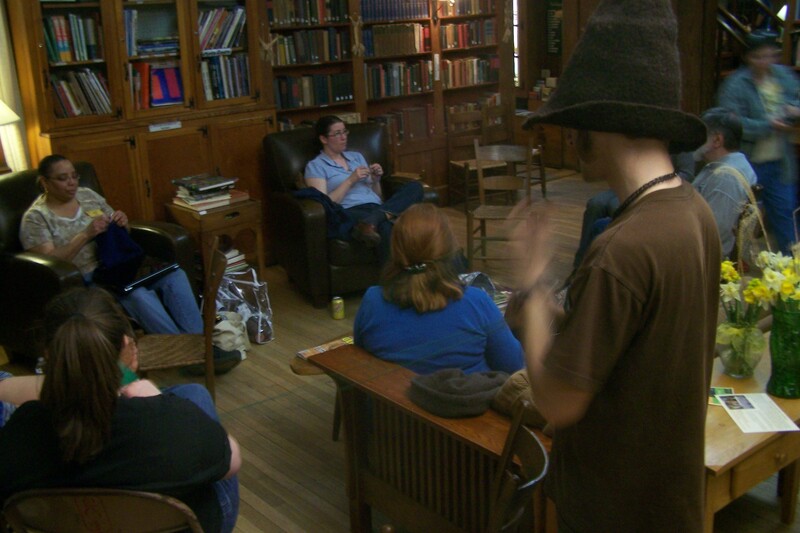 I earned my Masters degree in Crafts Education, and have been working full time in the “makers’ movement” ever since. I’ve taught knitting, fiber arts, tie dye, batik, bead weaving, gourd art, block printing, marbling, anything I could get my hands on. From a boarding school in the woods, to private clients in Brooklyn, I taught a really wide variety of crafts in a lot of great places and then in early 2016, decided to narrow my scope and focus in on one thing so that I could make a successful business plan. CP: How did you learn about dyeing and wax-resist dyeing or batik? 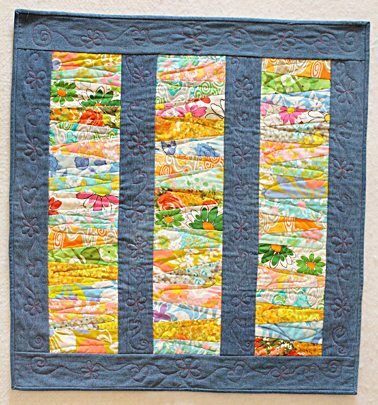 JK: I taught for over a dozen summers at one residential camp in the Brevard, NC area that had a really fantastic textile arts program. We had an entire program area devoted to dyeing: we did massive amounts of tie-dye, batik with the older kids, and candle-making (both mold and dip styles). Oh, we experimented and refined and studied and produced so many successful young artists! I was there long enough to see some of those campers come back as college kids and work under me in that program. During my time there, I focused on streamlining and organizing the workflow of the dye classes that we taught. When it was time to come up with a business plan for a tie-dye and batik studio, I had already done a lot of that work and knew how it should be set up. CP: What is your favorite thing about teaching? JK: It’s definitely that moment when I see a student start to really “get it,” when it all starts to click for them and you know they’re over the frustration hump. I am particularly fond of students who struggle with the same parts of the process that cause most people to stumble– it’s like, yes, this is exactly what everyone finds difficult to do, and don’t worry, because I’ve taken hundreds of people through this stage to the other side and I can promise you that if you keep trying, it will get easier and easier. You’ll start to gain mastery over that difficult thing, and you’ll feel so much pride and satisfaction! I gain satisfaction from watching them get theirs. One thing I’ve noticed is that younger people tend to come in as beginners with this wide open attitude and “why not” approach, whereas all the students I’ve had who arrived to their first class saying “I’m not going to be able to do this” were older folks. I think about that a lot, and I think that it’s the trying of new things that keeps us thinking and feeling young, by seeing ourselves as these beings who are capable of change. CP: Why is dyeing and batik meaningful to you? JK: I just have this completely helpless infatuation with pattern on fabric. Color on fabric. Fabrics from all over the world. Fabric that draws in your eye and maybe makes your mouth water a little bit. My personal aesthetic is smaller repeating geometric, balanced patterns that look hand printed, embroidered, knit or woven. 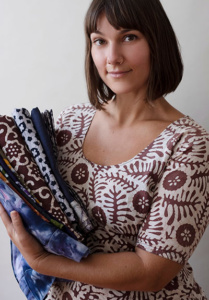 “Traditional” textiles from all over the world surround me in my bedroom and fill my closet. When I was a little kid growing up in Charlotte, NC, I was lucky to go to a magnet school and make friends with children from countries whose families had very recently immigrated. My group of friends were from Laos, Cambodia, Vietnam, Colombia, Ecuador, Honduras, and Nicaragua. One of these girls gave me a piece of fabric from her village in the highlands of Laos, when we were maybe 10 years old. Her family were Khmer and this piece of cloth was mostly indigo blue with some shots of yellow running through. I still have this fabric, thirty years later. In high school I bought fabric from vintage stores, flea markets, thrift shops. In college, friends would gift me random pieces of cloth that made them think of me. When I learned that I could print and dye my own fabrics it was like my head sort of exploded. That sense of endless possibility fuels me on a daily basis. CP: What is a typical day in your studio like? JK: There’s actually a huge change underway in terms of how I answer that question, and it’s very exciting. For three years, WAXON has been in start-up mode, functioning more like an artist’s private studio that I taught classes out of. Clients have been making appointments and that’s the only time we’re open to the public. However, in February 2019, WAXON will have a new storefront home in West Asheville– with a big classroom space and retail in the front and regular hours and everything! I expect the days will be pretty much the same; working on orders, creating one of a kind pieces, teaching folks how to batik and dye. CP: Tell me about your recent voyage to India. Will you be teaching some of what you learned on your trip? JK: It honestly changed my batik life. I’d been working primarily with the Indonesian tools, tjants, and stamping with cookie cutters and sponges, but once I saw the hand carved wood block stamps being used in the western Indian state of Gujarat, I felt compelled to go learn. There’s an excellent article about my time there and my batik hosts & mentors on Mountain Xpress. One of the most exciting things about this upcoming class is that I’ll be bringing all my precious, collected wood blocks for students to batik their hearts out with. It’s a very rare opportunity because not many people in the USA have studied this type of batik and I don’t know of anyone else who brought stamps back to use. Come take advantage! 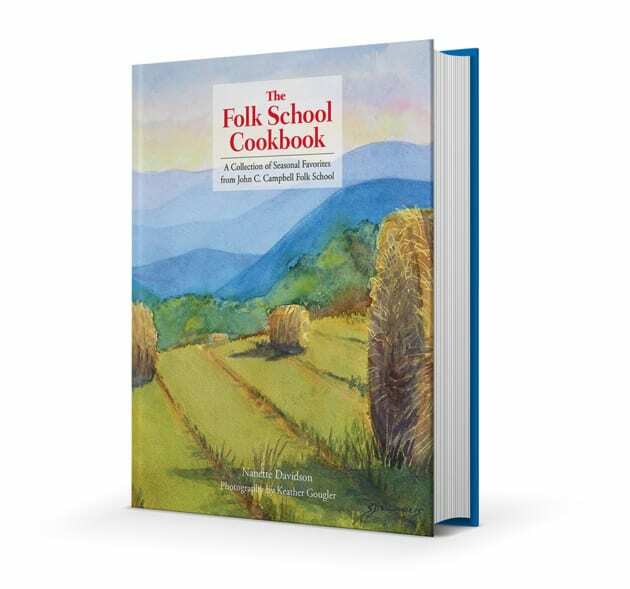 CP: What is your favorite class you have taken at the Folk School? JK: That’s a tough one because as a host, I took a class almost every week for six months. Imagine how many classes that was! I felt thrilled with almost all of my classes, but especially loved Martha Owen’s Fair Isle Knitting and sheep-to-shawl classes, Tony Prince’s glass beads class, and any basketry class I could get a spot in. I learned to clog and spin silk and forge iron hooks in the “old” blacksmith shop (before the new studio was built). Since then I’ve also returned to teach knitting and to take a silversmithing class, so choosing one favorite is just about impossible. CP: What is your favorite place at the Folk School? JK: I’m really drawn to the Vegetable Garden and Open House that looks over all the garden beds and the fields beyond– maybe it was the summertime dances and autumn weddings I’ve been lucky enough to go to there, or just the old-time feeling that that area has, but I just feel a certain special energy in the air when I’m walking around that spot. Plus, I love seeing what’s being planted and harvested and hearing the chickens. CP: You mentioned dancing; Does dance and movement influence your apparel collection? JK: It absolutely does, as does yoga. I’ve always been a very curvy to full-figured woman who loves to dance and stretch and move, and even when I’m slimmer, I’m quite rounded. I don’t often see bodies that look like mine represented in fashion. It’s really important to me that my clothing be wearable for movement and that it can span a range of body types and proportions. My hopes for 2019 are to release a collection of circle skirts in a knit plant fiber (like rayon, bamboo, or an organic cotton) that would be really perfect at a contra dance or square dance. I’m just trying to source the right blanks. They have to be dyeable, ethically produced, in the right price range, and ideally sewn with cotton thread. Pockets would be a bonus. We’ll see if any cross my path; if so I’ll snap them up and dye them. CP: What can students expect in your upcoming Surface Design class: “Studio Batik: Many Techniques, Amazing Results”? JK: This class is oriented towards the absolute beginner, but if you’ve already tried batik, that’s absolutely fine, you can come learn more. I’ll be bringing everything I use to create my work, and students will be able to try some one-layer pieces before they get into multiple layer works. Students can expect to go home with all the knowledge they’ll need of dye chemistry, fabric prep, material selection, a variety of tools, and of course, they’ll go home with plenty of fabric! 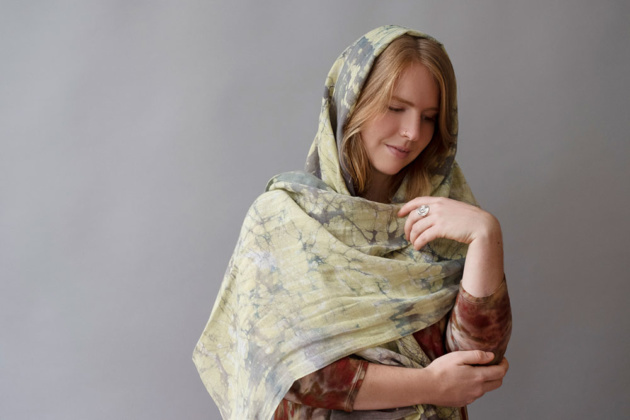 Work with a blend of paraffin and local beeswax to create multi-layered batik fabric and garments using methods that are easy to recreate in your home studio, garage, or anywhere! 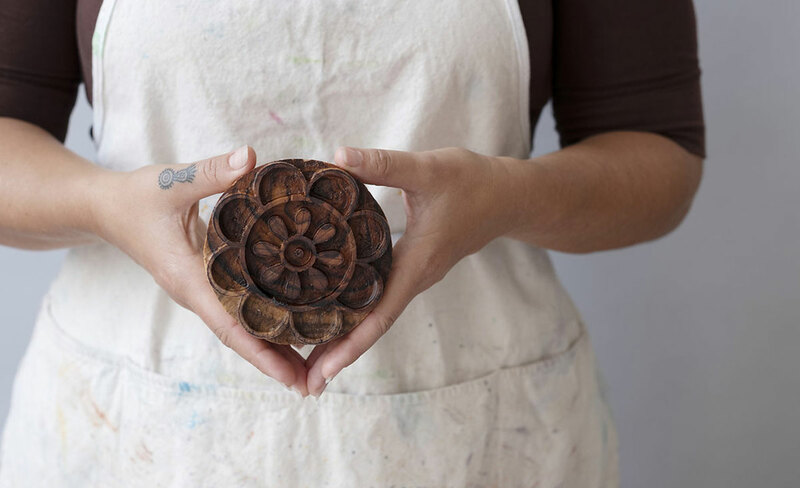 Hand-carved wood blocks from India will be available for creating intricate designs. Learn about fabric prep, dye chemistry, layering your colors, and wax removal. Register today! NextThe New 2019 Folk School Catalog has arrived! It’s Fall Y’all… Time to Quilt! I’m so excited to see Jessica featured on the blog. She was such a wonderful host (and person); I wish I could get back there for her class. I still have the hula hoop she made me!